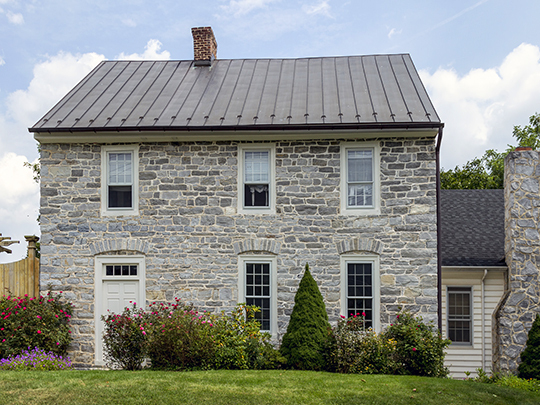 Photo: Rockland Farm (Davis House, Funk Farm), ca, 1773, near Hagerstown, Washington County, MD. Listed on the National Register of Historic Places in 1978. Photographed by User:Acroterion (own work), 2013, [cc-by-3.0 (creativecommons.org/licenses/by/3.0)], via Wikimedia Commons, accessed February, 2014. Washington County Courthouse is located at 100 West Washington Street, Hagerstown MD 21740; phone: 301-791-3090. Washington County was organized by the Convention of 1776 and was named after the great leader of the American armies, whose fame was then in the dawn of its brilliancy. Its territory was taken from Frederick County. The first grant of land in this county is dated 1732, and the original settlers were Germans from Pennsylvania, and emigrants from the eastern counties of Maryland. In 1850 it contained 30,848 persons, 1292 farms covering 159,851 acres improved and 60,878 acres unimproved lands. There were 169 industrial establishments. Washington County is bounded on the north by Pennsylvania state line, east by South Mountain, south by the Potomac River, and west by Sidling Hill Creek. Fisher, R. S., M.D., Gazetteer of the State of Maryland compiled from returns of the seventh census of the United States and Other Official Documents, J. H. Colton, New York and James S. Waters, Baltimore, 1852.